Booth #7360 - We will be featuring a Gudel TrackMotion Floor (TMF-1) with a FANUC CR-15iA Collaborative Robot onboard. 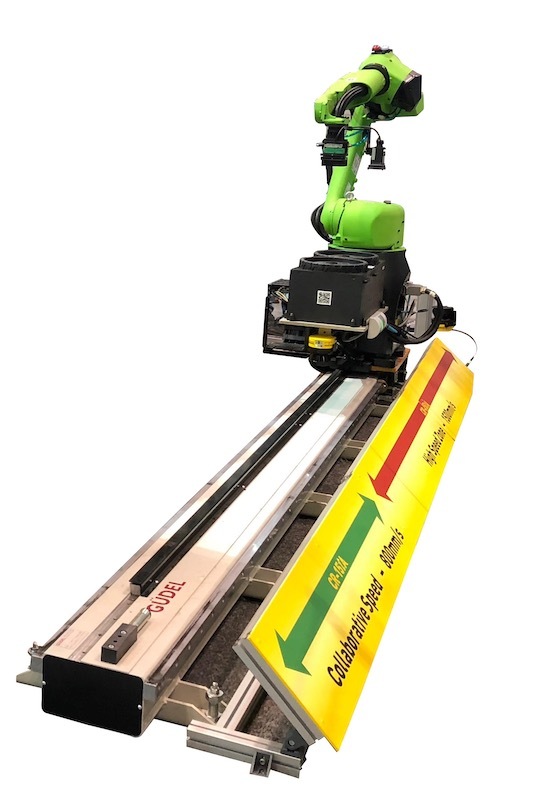 Cost-effectively and reliably extend the work envelope of any robot with Güdel’s TrackMotion floor mount configurations. Contributed by | Güdel Inc.
Güdel Inc. is the US subsidiary of Güdel Group, a global manufacturer of robotic automation products, systems and services. Güdel supplies linear motion modules, robot track motion units, gantry robots and components to OEM’s, systems integrators and machine builders serving the automotive, aerospace, logistics, heavy industrial and power generation industries. Güdel Inc. is headquartered in Ann Arbor, Michigan in a dedicated 45,000 square foot facility, providing North American customers with engineering, design, production, and customer service support. Automate brings together the best automation professionals in the industry and allows Güdel to reach integrators, end users and suppliers. This is an incredible opportunity for new business and networking. We will be featuring a Gudel TrackMotion Floor (TMF-1) with a FANUC CR-15iA Collaborative Robot onboard. Cost-effectively and reliably extend the work envelope of any robot with Güdel’s TrackMotion floor mount configurations. Güdel offers standard TrackMotion Floor (TMF) modules in multiple sizes to accommodate every robot brand and model, handling robot payload capacities from 3 to 2300 kg. Built with Güdel gearbox, gear rack and guideway components, in addition to our proprietary roller bearing cartridge system, our TrackMotion modules are highly reliable and provide unique ease-of-maintenance features. We have a new demo cell coming to Automate and you won’t want to miss it. Come see how we are collaborating with FANUC on this unique demo cell! Experience Heavy Payload Automation in Virtual Reality. 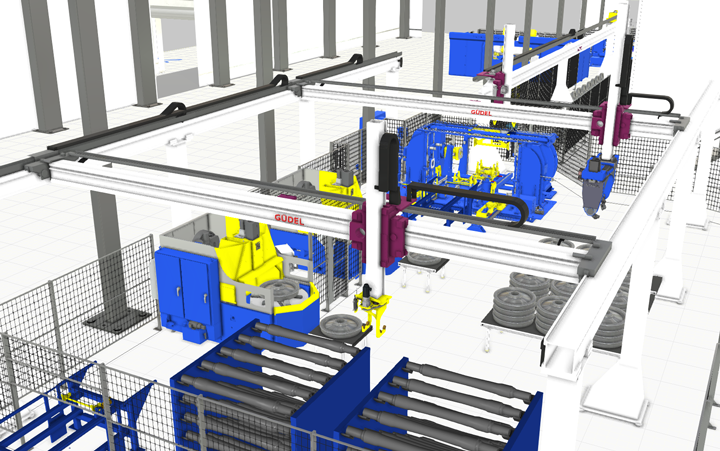 Güdel partner Simmons Machine Tool Corporation will be demonstrating heavy payload automation through a virtual reality (VR) experience located inside Güdel's booth 7360. The heavy payload demonstration includes a railway wheel machining center consisting of FP-7 area gantries for picking up complete wheel sets as well as axles and wheels. Join Bob Rochelle for “Getting Started with Robots” Industrial Robots are the heart of Lean Manufacturing and are vital to the current vibrant manufacturing economy in North America. The “Getting Started with Robotics” presentation is an introduction to the Industrial Robotics or Flexible Automation Industry. Bob will explore Robot Based Automation Systems to include how the industry functions, why to choose robot based automation, principles of system integration, general principles of robot technology, the business case for automating and calculating ROI plus the common mistakes made in Robot Integration. Come learn more through discussion and evaluating system photos and videos illustrating various robotic based flexible automation systems. You will have two opportunities to benefit from this great session, Monday, April 8 (8:00am-10:00am) and Thursday, April 11 (8:00am-10:00am). Our team is always looking for opportunities for our product portfolio in new industries. Additive manufacturing and 3D printing have become interesting for Güdel and we continue to see new application uses in these fields with our gantry robots and robot track motion units. Güdel is starting to incorporate condition monitoring packages on Güdel-manufactured roller bearings for use on after-market retrofits of our gantry robots. Güdel defines and uses Condition Monitoring for a set of IIoT based products and tools for Güdel customers to perform condition based maintenance on smart Güdel products. We will continue to see more of the smart factory embedded across our entire mechanical product offering. This has many advantages that will help us stay better connected with our customer base and ensure that our products continue to run without downtime. This will also allow the Güdel Service Team to expand its offerings in the aftermarket sector and become proactive by being better able to predict and communicate to our customers when action needs to take place.